There have been many modern depictions of Lady Jane Grey (1537–1554), England’s “nine-days queen,” yet no life-portrait of her is known to exist. She remained ‘invisible’ despite being the focus of considerable courtly attention in May and June of 1553. John Dudley and Henry Grey, Jane’s father, struggled to set aside Mary Tudor’s claim to the throne of the dying Edward VI. Jane’s bestowal in marriage was a critical element of their plan. 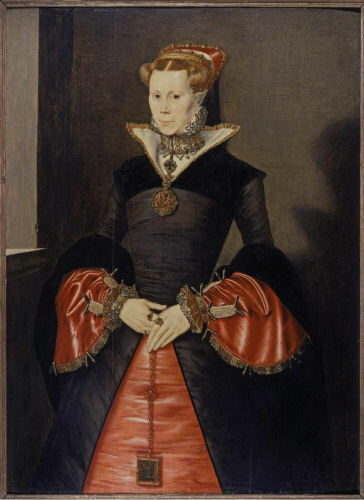 Circumstantial evidence suggests that Hans Eworth’s Unknown Lady is a pre-marriage portrait of Lady Jane Grey created in connection with the plots of May and June 1553. The painting dates to the first half of the 1550s, early in Eworth’s career. Eworth’s earliest associations were with the circle of John Dudley, the political ‘rising star.’ Eworth painted some of Dudley’s familiars, including Thomas Wyndham and John Luttrell. He is thought to have painted several others, including Dudley’s daughter Mary. He was thus in a position to portray the daughter of Henry Grey, Dudley’s closest ally. Marriage was the most common reason for painting a Tudor-era woman’s portrait, often as part of the betrothal negotiations. These portraits recorded and conveyed to potential suitors the physical and social attributes of prospective brides, especially among noble and royal families. Unknown Lady is likely such a pre-marital portrait as the sitter conspicuously wears no wedding ring. Items of clothing or jewellery worn in Tudor portraiture offer highly specific clues to the sitter’s identity. Tudor portraits ‘are as much portraits of clothes and jewels as of people – mnemonics to commemorate an extravagant suit, a new fashion in ruffs, a necklace or jewel – in the words of Anne Jones and Peter Stallybrass, Renaissance Clothing and the Materials of Memory (Cambridge, 2000). The richness of this sitter’s jewellery, including numerous pearls, diamonds, and other precious stones, suggests that the sitter was the daughter of a very wealthy person, probably a high-ranking nobleman. In mid-1552, there were approximately forty-eight titled nobles in England. These men had between them fewer than a dozen eligible daughters still unmarried after 1550. 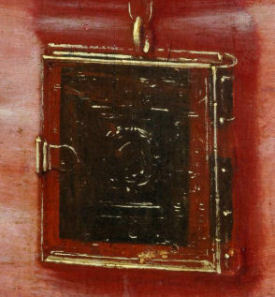 Little more than names are recorded for the majority, leaving no evidence to connect them to the portrait. But one noble family, that of Henry Grey, had three well-documented daughters approaching marriageable age at this time. Henry was one of only two English dukes during 1551–53. His wife, Frances Brandon, was the eldest niece of Henry VIII and one of the highest ranking females in the kingdom. Daughters Jane, Katherine, and Mary were not only heirs to his large estates but also cousins and heirs to the king himself. The eldest, Lady Jane, was preceded in rank by only her mother and the Princesses Mary and Elizabeth. Such status and wealth made Jane an exceptional marriage prize well worthy of a portrait by Eworth. The depiction of the young lady is consistent with what is known of Jane’s appearance. An eye-witness, Baptista Spinola, described her as very small, with hair ‘nearly red’ and eyes that were ‘rossi’, a light hazel often noticed with red hair. Her skin was lightly freckled, and she was very thin with small features. Indeed, the sitter is remarkable among all women in Tudor portraiture for her uncommonly thin, even hollow-cheeked face. Such unusual thinness may be the result of a series of illnesses, both physical and emotional, that Jane suffered. John ab Ulmis refers to a ‘severe and dangerous illness’ from which Jane recovered in early 1552. Jane herself recounts a later illness caused, she claimed, by her new mother-in-law attempting to poison in June of 1553, resulting in all of her hair falling out. These symptoms may also be attributable to psychosomatic disorders, especially during the troubled, plot-filled months of early- and mid-1553 when the portrait was probably painted. Such ‘nervous’ symptoms were not uncommon among religiously devout and ascetic young women such as Jane, and often resulted in thinness and a prematurely aged appearance. The lady’s costume has been described as ‘sombre.’ The fabrics, without brocading or extensive embroidery, are indeed subdued by the standards of the Tudor courts. Jane is noteworthy for her unconventional attitude toward dress fabrics. A contemporary anecdote describes a scene wherein Princess Mary presented Jane with a gift of ‘apparel of tinsel cloth of gold and velvet, laid on with parchment lace of gold.’ Jane rejected the royal gift as inappropriate for a follower of God’s word. Jane’s adherence to the reformed religion and her readings of the works of continental reformers, coupled with her correspondence with those reformers, inculcated within her an austere taste in dress. Her correspondents instructed her ‘as to what embellishment and adornment of person is most becoming in young women professing godliness,’ inveighing against the use of gold and jewels and ‘braidings of the hair.’ James Haddon, the Grey family chaplain, preached to the entire family ‘as to what may be superfluous in food or clothing, ...and [may make] one’s dress too gaudy and expensive, or in any other respect beyond what is necessary, this is a voluntary superfluity and a self-sought sin.’ Jane very likely internalized these admonitions and expressed them through a modest habit of dress, just as is depicted in the portrait. The jewels are all rich in composition, but decidedly religious in theme or purpose, suggesting that the woman was not only quite wealthy but was also quite pious. 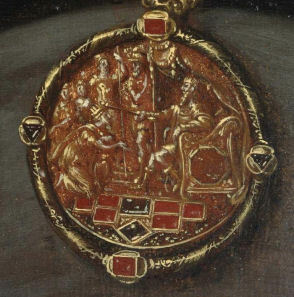 In particular, the brooch (Fig. 2, below) depicts the Old Testament story of Esther. Read allegorically, the scene suggests a devoutly religious woman (i.e. Jane, a Protestant) offering herself in marriage to save her co-religionists from persecution by a hostile monarch (Mary, a Catholic). Because only Jane’s potential male children could legally inherit the throne, not Jane herself, Jane was offering herself in marriage as a vessel through which a Protestant male heir to the crown could be conceived. The brooch conveys the wearer’s pious self-sacrifice in service to her faith, ominously presaging Jane’s later martyrdom. The second family is Jane’s own, the Greys of Dorset. Jane’s father acceded to the marquisate of Dorset in 1530. He was commonly known thereafter by his title rather than his surname, signing all documents ‘Henry Dorssett’ (until late 1551). His correspondents also refer to him as ‘Dorset’, not ‘Grey.’ The ‘D’ on the book may therefore a monogram for ‘ Dorset.’ All of this evidence combined supports an identification of the sitter in the portrait as Henry Grey of Dorset’s eldest daughter, Lady Jane Grey. Since publication in December 2005 of the article derived from the above research, several scholars have challenged my proposed identification of the sitter as Jane Grey, beginning with Hope Walker in an entry in the exhibition catalgoue Lost Faces: Identity and Discovery in Tudor Portraiture (London: Philip Mould, 2007, pp.86–87) entitled “A Portrait of Lady Jane Dormer, Later Duchess of Feria?” Those challenges have significant merit. When combined with my own subsequent research, much of which can be found elsewhere on this site, I have concluded that the sitter is indeed unlikely to be Jane Grey. It is certainly not the ‘lost’ portrait itemized in Bess of Hardwick’s inventory of 1565. I have not returned to re-identifying the sitter, preferring instead to leave that task to others while I focus on portraiture of Jane Grey. I do hope that someone will eventually restore this woman’s lost identity, however. I leave the page otherwise intact as a record of my first foray into the fascinating world of portrait history, and as an example of how one scholar’s opinions can change as new knowledge is gained.